It's a good choice, large variety of loads available including .38 spcls. Reasonable recoil and accurate. Carried a S&W for years. Switched to a .45 LC just because I had one and kept running into wild hogs that needed a good thumping. Now usually carry .45 acp because it rides a little "softer" and tighter under my jacket. Carry what you are most comfortable with both shooting and accuracy. A 4" DA revolver is my constant companion while woods bumming or working the tractor. I like the Ruger GP100. I own a LOT of revolvers. My 4" GP100 stainless is the perfect choice for your needs. A 6" bbl will make it easier to shoot longer than 25 yards accurately but you wont want it on your belt all day. Add a solid OWB thumbstrap holster on a good belt and you will be happy. Check the used guns - Rugers are built like tanks and cannot be shot out. Good deals available on great pre-owned guns. My 2nd choice [lighter weight] is a K frame S&W. The model 66 .357s are pricey even used but look for an older .38 police trade in and fill it with +P+ loads. One of those never leaves my truck console. 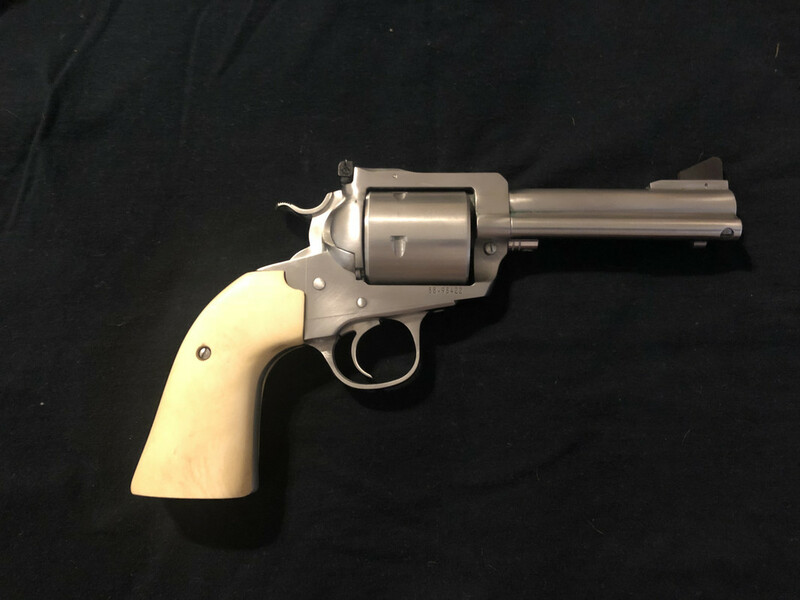 If you want a real deal find a blued model of one of the above with some holster wear or minor cosmetic issues; they can be had cheap from a pawn shop and are still fantastic guns. .357 can be a handful in a lighter revolver. GP100 comes in 7-shot now and has enough heft to tame the .357 some. If you don't want a heavier revolver strapped on you while working, the SP101 in .327 is a six-shooter in the same class as a lighter .357 and shoots flat for longer distance tries at coyotes. These guns really need a good holster and a good belt to wear comfortably. I use revolvers for about everything except what you mention. The Kel-Tec PMR30 with a light on it is the ticket for that sort of thing. It rides in a cheap slide holster on a nylon belt. Didn't know they re-introduced the .327. Those guns and ammo had disappeared for a while. Might need to look for a SA model if available. Look at the new S&W 66. With a 4.25” barrel it should be a bit lighter than the GP100. My 69 has a good factory trigger and is a blast to shoot .44 specials with. Shiloh Sharps is my long distance provider. Real gunpowder is BLACK and makes a lot of smoke! That smokeless stuff is just a passing fad! I"m more of a semi-auto guy.......but a .357 is certainly a great one for all purpose use. Heaps of loads available for it that are good for everything from snakeshot to deer loads. When it comes to wheel guns I tend to prefer Ruger. Thank you for all the input. I have narrowed it down between the S&W and the Ruger GP100. I carry an old Smith and Wesson 681 around while hiking off trail or bank fishing. First 2 holes are snake shot, the rest are jacketed soft points. I have a Ruger SP101 in 357 that I bought for just that purpose and it's a small but beefy 357. It's a great gun but it can be a bit uncomfortable shooting Medium to hot 357 loads. I have since bought a S&W 60-10 J frame that is a much lighter and smaller gun but it is surprisingly more comfortable to shoot. I'm guessing it's the slightly larger Pachmayer Grips. It is an absolute dream trail gun to carry and shoot. I carry a Ruger Super Redhawk with 7 1/2 inch barrel in 44mag. It is not lightweight by any means but it is a sweet gun to hunt with. I did some trigger work to is and it shoots very well. I have a S&W 686 6" barrel in .357 that i carry occasionally...Pocket gun is Taurus 2" .357 that fits nicely in jacket or trouser pocket....Snubby is also fun to shoot with .38, and 38+p loads.. Both are SS guns..